“If you’re not being you, then he looks at what he can do to make you comfortable. He’s one of my favorite coaches of all time.”"
He returns to Utah tonight for the first time since leaving the Jazz two summers ago for the Boston Celtics. I desperately wanted him to stay with the Jazz and Jazz fans are totally in their right to boo him for leaving. That's the way sports works. I would have loved to see him, especially as my favorite player and the lovable dorky nerd gamer he is, buck the current free agent trend and stay with his original team despite the small market. It didn’t happen. And it was ugly. The leaked decision and the subsequent Players Tribune post made a tricky situation a certifiable mess. When a big free agent leaves a team, it usually leaves them in an unenviable spot. However. Donavan Mitchell is a STUD. Obviously that is a happy coincidence lining up with Hayward’s flimsy departure, but the Jazz are more than happy with Mitchell and are anything but left high and dry after Hayward exited in free agency. Added into the Hayward mix is his devastating injury seconds into his career with his new team. It wasn’t just any injury either, but a gruesome one on national TV that could very well have ended his young career right then and there. The ultimate humbling variable in sports is injuries. Just like in non-athlete, regular human life, health is precious. To an athlete, health is their livelihood. Gordon was forced to miss an entire year of his career and the pain he went through on that night is something I hope you and I never have to experience. I’ve gotten to meet Hayward a couple times when he came through Dallas. It was brief, short and sweet as most athlete encounters are. 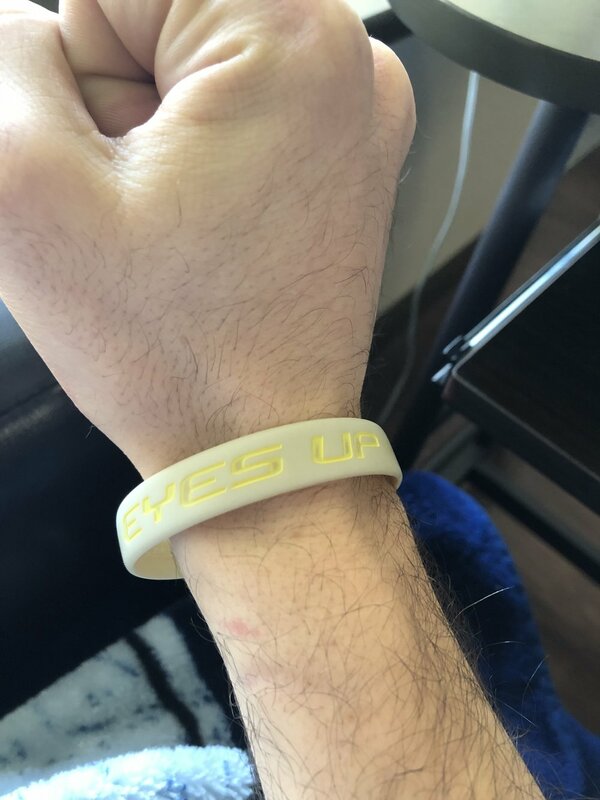 He gave me his wristband that he wears during games, with the words “Eyes Up Do The Work” inscribed into it. That was in 2014. I still wear it. So let’s not boo Gordon. The Jazz are just fine. And he’s expecting his third daughter. He desperately wanted a son. Give the guy a break. P.S. I’ll throw on my green Jazz Hayward jersey for the game tonight.